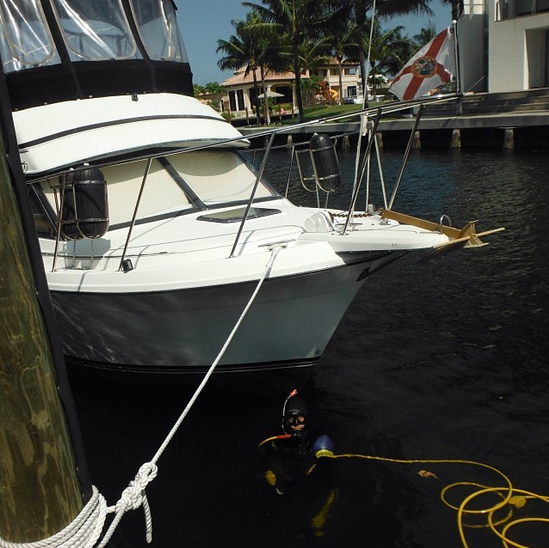 Call Chuck (754) 423-0763 for Boat Bottom Cleaning, Propeller Repair/Installation, Zinc Replacement, Salvage & Recovery. We are located in Fort Lauderdale, FL. Keep Your Bottom Clean dive service is owned and operated by Chuck Doria and his family. Chuck is a native Floridian and ocean enthusiast. From sailing, to fishing, to diving we understand that your time spent enjoying the beautiful waters of Fort Lauderdale are precious. So, we ask you to give us a call and let Chuck take care of your underwater dive service needs. His 40 plus years of diving experience will provide you with fast friendly service in order to keep your vessel in prime condition. Our dive service will keep your boat bottom/running gear/thru-hull intakes clean and free from biological growth such as algae and barnacles. This service will reduce fuel consumption and propeller vibrations as well as increase acceleration to your vessel, allowing for a smooth sailing experience. This blog is being posted to reiterate to those interested in Keep Your Bottom Clean dive services that our business is based in Fort Lauderdale, Florida. Also if you have used our services before check us out on Yelp athttp://www.yelp.com/biz/keep-your-bottom-clean-dive-service-fort-lauderdaleUntil next time Keep your bottom clean!